In August 2014 four women came together to research and develop the first draft of a new play The Orchard. It wasn’t even a first draft, it was two monologues for two actors. Although intended to be a dialogue playwright Natalie McGrath wanted to find the voices of the characters, she was finding one easier than the other and so wanted to play with them in a rehearsal room. And we really played, joyfully and democratically, we read the monologues, spliced them apart and slotted them together to begin a conversation between the characters. Once we had created the start of a dialogue we invited a small audience to hear it. The characters were Emmeline Pankhurst and Millicent Fawcett, two women who, one hundred years ago had a huge impact on the rights of women but had opposing ways of achieving their goals. What came out of that work in progress showing was a determination that these voices should still be heard, maybe over the years they had become silent to new generations of women and with a general election coming and 9million women not using their vote in the last election, it was time those voices were heard again. With funding from Arts Council SW, Exeter City Council and Fawcett, Devon, Dreadnought South West are touring with a roadshow – an imagined meeting and conversation between Emmeline and Millicent as it isn’t documented that they met on their own after Emmeline left the National Union of Women’s Suffrage Society (NUWSS) to set up her own movement. What is so fascinating as we dissect their rise to power and their tussle between militant or peaceful methods is how pertinent that central argument is to today’s politics…the impetus to walk for hundreds of miles across a country in protest, or to chain oneself to railings or go on hunger strike whilst in prison in order to have a voice and be considered an equal citizen. As Pankhurst says in The Orchard ‘the world must get used to hearing us speak’ that is an incredible idea to get a twenty first century head around. We think we are used to hearing women’s voices, but are we? Is it a lack of hearing women’s voices in the public realm the reason some women don’t vote, because they think they won’t make a difference? We have gone off onto the road to ask questions like these and to receive some answers from our audience. 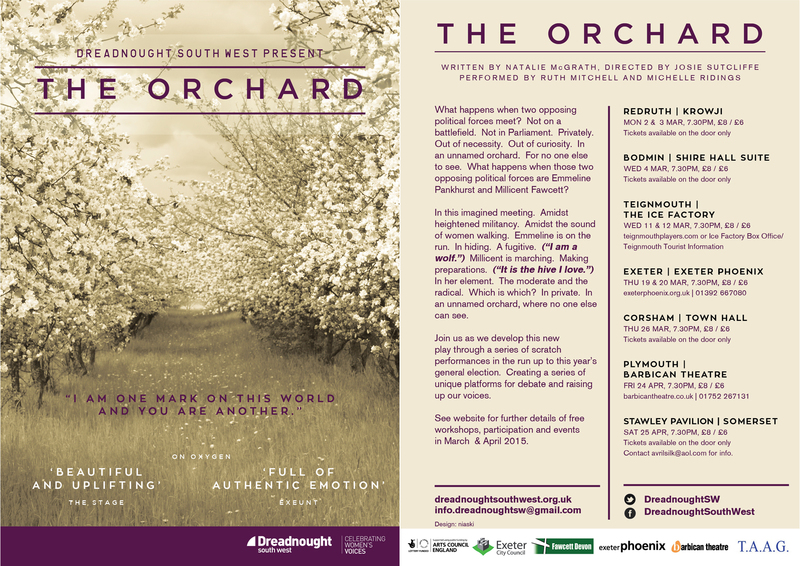 Our roadshow will be a scratch performance of the play The Orchard, a script in hand reading which, of course, some people may have a problem with. Is there any benefit from seeing a ‘reading’ when the actors are only engaging with a small percentage of what is required if they were performing a fully rehearsed show. I have seen many performances by theatre makers who read from a script after many weeks of research and preparation, I have seen performances that question the very premise of what is a traditional theatre performance and what isn’t and I think the time for theatrical snobbery is over. This is a different way of engaging with an audience, this performance is followed by a conversation with them but more than a question and answer between us and them, a dialogue about what they saw, how they perceived it and whether it came across in the way we had hoped. Any feedback will then be fed back into creative discussions and these discussions will shape the final draft of the play. This method of gathering an evalued response creates a platform for the voices of the audience and not just female voices. Last night was our first showing at Krowji in Redruth Cornwall, an artistic hub for creatives across different practices. In a rehearsal room with a log burning stove we performed in traverse for forty minutes and then sat for twice that time whilst every member of the audience returned and every member of the audience responded. They weren’t asked to but volunteered to. I have never witnessed that in other Q&As. The audience considered everything they had seen; the relationship between the two women, the setting of piece -not just in traverse but also why an orchard. They wanted to know where the audience were coming from, they wanted more young people to see it because there was so much to learn…is suffrage still taught in Schools? One history teacher spoke up, we have to obey government guidelines… well I know how Emmeline would respond to that! To perform as part of this process is very emancipating, our voices ARE being heard, as I come to terms with who I am playing the audience are feeding me with their outside eyes and this feels very democratic. We finished on a point made by a male member of the audience ‘it’s not just a feminist thing, its a human thing’ he said and that seemed to sum up the evening in every way and it makes me very excited to hear how other audiences will respond. The roadshow continues, as will the blog responses. This entry was posted in Performances, Research and tagged Dreadnought SW, Emmeline Pankhurst, Josie Sutcliffe, Michelle Ridings, Millicent Fawcett, Natalie McGrath, Ruth Mitchell on March 4, 2015 by Ruth.